This sword belongs toJyo Jyo saku ranking. ranking. Habaki :Copper and gold wrapped double habaki. Blade length : 55.4cm or 21.8inches. Width at the hamachi : 2.99cm or 1.18inches. 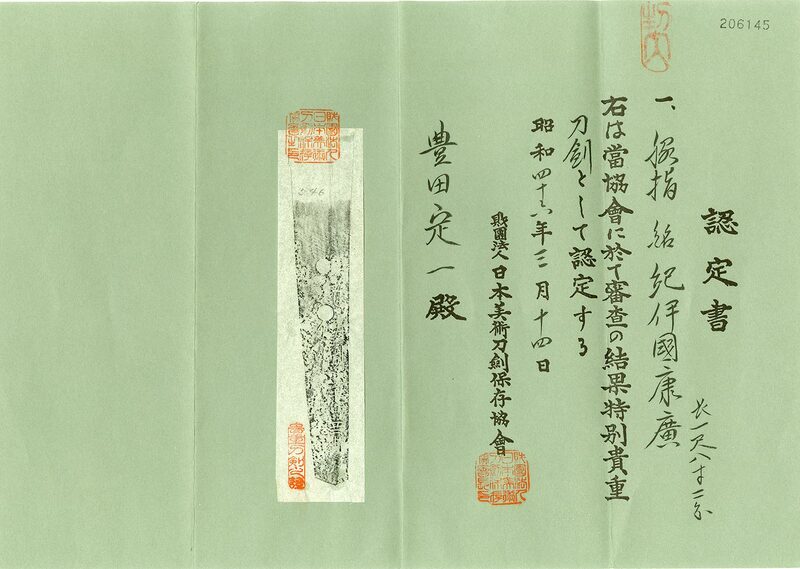 Width at the Kissaki : 2.12cm or 0.83 inches. Kasane : 0.65cm or 0.26inches. Shape : The blade is rather long size wakizashi with suitable sori and longer kissaki. Jigane :Koitame hada well grained with jinie attach and visible to see the Utsuri on the Ji. Hamon :Konie deki cyoji midare hamon with ashi and yo work. Special feature.Kii kuni Yasuhiro is second son of the Tameyasu and called Tomita Gorozaemon. He was working at Kisyu province and moved to Kyoto and Osaka First he named Yasuhiro and changed the name to Yasuhiro. He made Ichimonji utsusi like Katayama and Yoshioka. Tsuba :On the round shape iron Tsuba, the rime is rope style engraving. and engraved flying birds with Sukashi style. Menuki : Shishi dogs are engraved with gold color. Fuchikashira:On the syakudo nanako plate, shishi dog is engraved with gold color. From Aoi Bijyutsu:Kii kuni Yasuhiro is very skillful sword maker. is also nice Cyoji midare and also nice Utsuri appear. Koshirae is also well balanced nice Kodo-gu wer used.